Citation Information: J Clin Invest. 2016;126(4):1592-1602. https://doi.org/10.1172/JCI85908. Identification of a region within exon 11 of Lmna that affects prelamin A and lamin C expression. (A) qRT-PCR identifies several ASOs that increase the lamin C/prelamin A ratio. Wild-type MEFs were transfected with overlapping 18-nt ASOs corresponding to sequences in exon 11 of Lmna. After 2 days, mRNA levels for prelamin A, lamin C, and total lamin A/C were measured by qRT-PCR. 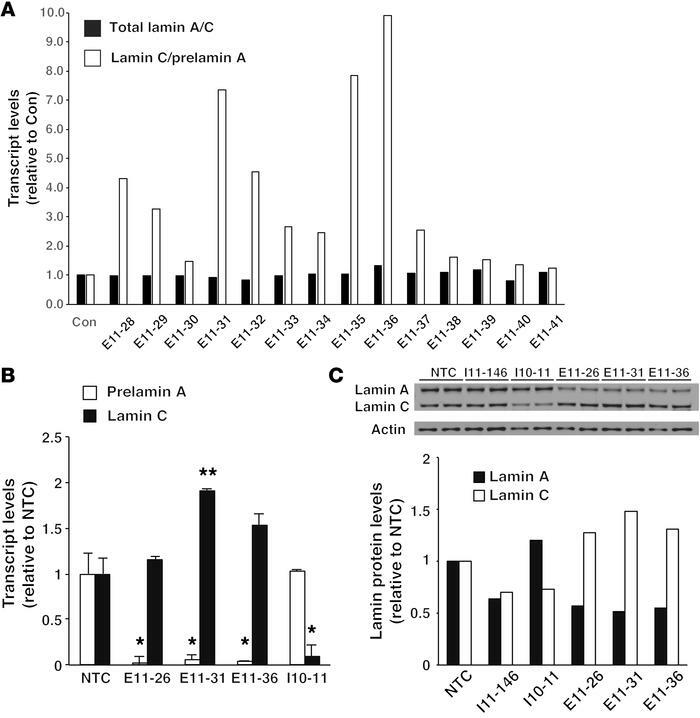 Total lamin A/C levels (black bars) and the lamin C/prelamin A ratios (white bars) were calculated and expressed relative to control-treated cells (Con), set at a value of 1.0. (B) ASO E1-31 promotes lamin C splicing. Wild-type MEFs were transfected with ASOs E11-26, E11-31, E11-36, and I10-11 (I10-11 is located in lamin C’s 3′ UTR). After 2 days, mRNA levels for prelamin A and lamin C were measured by qRT-PCR. The expression was normalized to levels in cells that were treated with transfection reagent alone (nontemplate control [NTC]) (set at a value of 1.0). The mean ± SEM for 3 independent experiments is shown. Comparison with nontemplate control: *P < 0.05; **P < 0.01, t test. (C) Western blots showing that ASOs modulate lamin A and lamin C protein expression. MEFs were transfected in duplicate with ASOs I11-146, I10-11, E11-26, E11-31, and E11-36. After 2 days, cell extracts were prepared and analyzed by Western blotting with antibodies against lamin A/C and actin. The band intensities were measured by infrared laser scanning and normalized to actin. The results were expressed relative to the nontemplate control, set at a value of 1.0.